I am just back from TMEA 2011 (Texas Music Educator Convention, the biggest MEA in the country. Everything is bigger in Texas.) Before that was the Capital Tuba conference at Ft. Meyer in D.C., an annual event. Unfortunately I do not get to hear the performances because the exhibit room is busy constantly. I had on display the J-870 CC tuba in what seems to be the unanimous preferred mouthpipe angle. The only minor complaints I heard were from very tall players who expect the mouthpipe to be low for them anyway. I took pictures of almost everyone who tried it. You can see for yourself in the links. Comments ranged from “This is the best horn here.” to “This is the best value on the market.” to Is the J-870 CC tuba in production? Is the mouthpipe angle changed? Can I order one? Yes, yes and yes. The J-700 BBb tuba is also in production. We haven’t had as many come through as we would like but they are coming through. The instrument I have been showing at Capitol Tuba Conference and TMEA IS a production model but it is one that had the ‘over-correction’ mouthpipe and was then modified with the final version mouthpipe. I have referred to it as a ‘proto-type’ because it was modified and the solder marks show. I am experimenting with the fifth valve mechanism on this instrument and therefore continue to refer to it as a proto-type. (Sorry if that confused anyone.) You can order one just like it. If you have trouble locating a store send me an email. (rbarth@gemeinhardt.com). Thanks to everyone who came to those exhibits to try them. Either you were being kind or they were the best tubas on display at those exhibits. I don’t recall anyone who didn’t like them. Pictures are posted under ‘Capitol Tuba Conference…’ and ‘TMEA 2011’. So here’s the skinny: Orders placed before **(I previously said 2/8)will arrive approximately 9 weeks later. We continue to work on fit and finish and are resolved to travel to Brazil to inspect every instrument. Weather and Travel have pushed this back. **February 24 is a more likely date. The J-700 BBb tuba is also in production. I have yet to meet the tuba player who would not recommend this to any school. 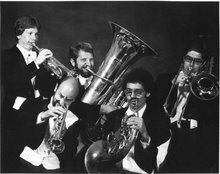 In fact band director/tuba players often complain that they just bought 6 #$%^&*&^%$#$%^ tubas and would have specified the J-700 had they known about it. Don’t let them make the mistake. Spread the word. And thanks.